We live on an alley. I’ve mentioned it before. It’s just part of living around here. No yard, no grass, some city-planted trees and a bunch of cement! Poor us. But hey, the ocean is just five blocks away so I guess I can get over the lack of a real yard to play in. It could be worse. We could live in the city with no yard, no grass and no ocean. I think we’ll survive. Before I had Baby Bug, I wondered what it would be like to raise a child here. When I was a kid we always had a huge back yard. There was always a garden, some form of a rusty old swing set, a treehouse, plenty of mud and dozens of neighborhood kids to run the streets with. We lived on a barely-paved, dead-end street in the country. We never worried about cars running us over, let alone a cement truck barreling down the highway. I don’t think I even knew what a jackhammer was until I moved here. So what do you do when you have a restless child who wants to play outside but you can’t just push her out the door into your relatively safe backyard? After you’ve gone to the park and the beach about seventeen million times, you start to look for other options. 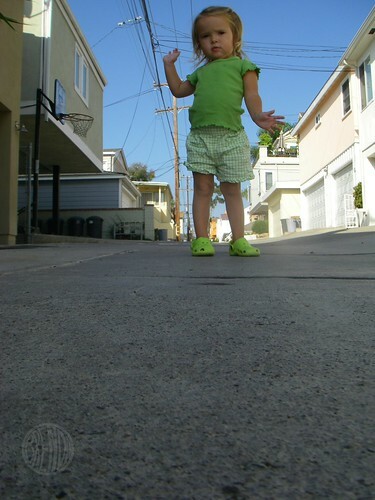 We like to take walks in the alley. There are neighbors we can visit and all sorts of things to explore. There are trash cans to peek into (from a distance of course—nothing gross), cracks to follow, rocks to collect, dandelions to pick…we find things to do. She finds things to do. I just follow her and mutter to myself about my lack of cell phone coverage. My latest fun thing to do in the alley is to collect found objects. I’m sort of picky about what I will stick in my pocket though. No leaves or rocks or anything natural. 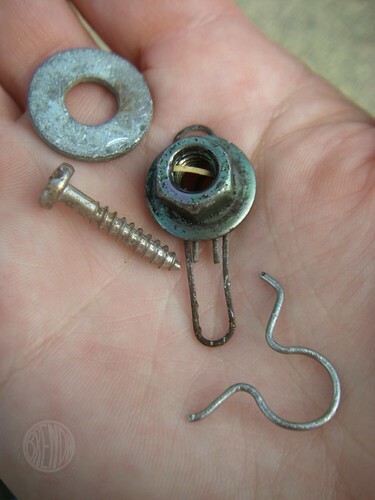 I like to pick up old rusty washers and nuts and bolts, paper clips and screws. It’s silly I guess, but I think it’s fun. In my mind I’m going to create an art piece with these someday. I don’t have enough yet to even begin anything but someday I will. That is if Toby doesn’t find and toss my collection first—he thinks I’m nuts. I guess I’m just a scavenger. But really, I’m probably saving someone from a flat tire so you could think of it as a good deed. It’s not really the best project for Baby Bug yet. I don’t mean to encourage her to pick up dirty, oily, possibly sharp things. It’s fine because she’s way more interested in finding rocks and leaves anyway. But it does help me to keep my head from exploding when she wants to go anywhere but in a straight line while we are out walking. I’ve always liked collecting things. It’s like hunting for sea shells but without the fear of getting a ticket from the beach police. 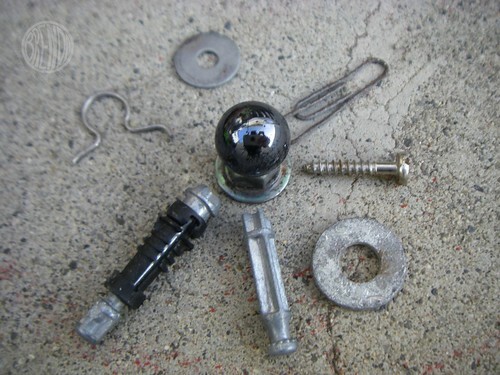 Collecting old nuts and bolts and discarded pieces of junk isn’t going to get anybody into trouble as far as I know. As long as it isn’t smelly and stinky and going to take up space in our house, it should be a perfectly harmless hobby. Someday this collection is going to be a huge collage of cool pieces of junk: 100% recycled art! Maybe it’s hard to visualize but I can see birds with paperclip wings and washer eyelids with marbles for eyes. Screws and nails might be the sharp ragged grass. Who knows, it might just be a big collage of junk that nobody wants all glued together in one piece. But it will be fun. It will be a lesson in reclaiming what has been discarded. I’ve also been wanting to do this at the beach too but with plastic found objects instead of metal. The beach is always filled with brightly colored bottle caps and twisty ties and tumbled who-knows-whats. That will have to be another blog post though because we haven’t done it yet and I have no photos!